For those of you under the age of 40 or thereabouts, it's kind of hard to explain what home entertainment was like back in the early 1980s. Yes, HBO was around, but there weren't a whole lot of us who had it yet. Our evening's choices on TV were limited to the "big three" networks (ABC, NBC, and CBS) and PBS if we wanted to watch the news, children's entertainment, or a documentary. VCRs hadn't yet stormed their way into every home in America, so after a movie closed its run at the local cineplex (there weren't many of those, either - most theaters had a single screen), your only shot of seeing it again (short of a re-release) was on television. Because of the above, viewings of theatrical films on broadcast TV weren't "filler" (as they are today), but an event. You'd get one chance a year to see The Wizard of Oz or Citizen Kane and that was it. For most movies that ran two hours or less, the film would be edited down in order for it to fit its TV time slot (which, of course, needed room for commercials). Some longer films, however, were split up into a two-night event and resulted in the producers actually adding cut scenes back into the film, meaning those at home would be seeing a new version of the movie never seen before. Such was the case in 1977, when the first two Godfather movies aired on TV - a four-night event on NBC, where director Francis Ford Coppola re-cut the two films into chronological order. There was also the NBC broadcast of 1977's King Kong, which added almost an additional hour into the movie. These are just two of many examples. 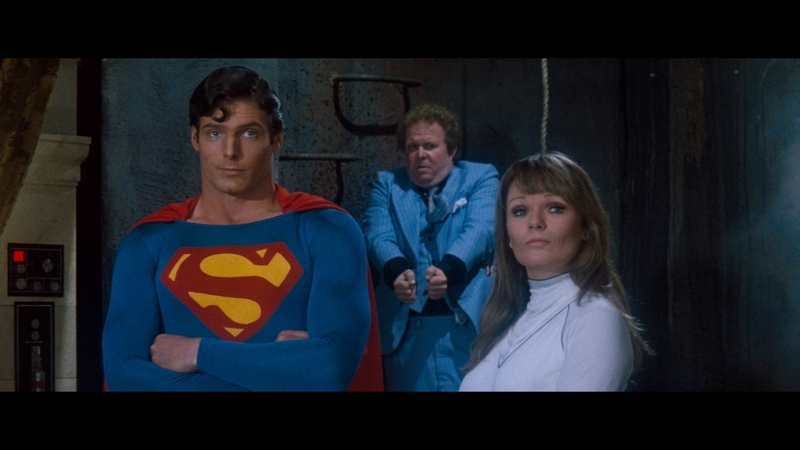 But one of the most talked about TV versions of a movie over the years has to be Superman: The Movie, which aired over two nights on ABC (a Sunday and a Monday, if memory serves) and added about 45 new minutes to the theatrical version. Finally, after all these years, that TV cut is now available on Blu-ray. The anticipation of the TV cut coming to home video was no doubt dulled when Warner Bros. created a Special Edition cut of the movie for release on DVD in 2001, then released a Blu-ray version in 2011 as part of a Superman boxed set (that Blu-ray is the second disc of this set). Director Richard Donner had input into that cut of the movie, and he re-incorporated some of the scenes from the TV version, but also left a bunch out - some of which are bonus scenes on that disc, some of which didn't get added. Donner, in fact, had no say at all over the TV cut, with the producers (Ilya and Alexander Salkind) handling that version. So how does the TV cut hold up after all these years and how does it compare to the other two versions (both the Special Edition and the original theatrical)? Well, it's sort of a mixed bag. The theatrical cut will always be my personal favorite, possibly because it's the version I watched first, but also because it gets the pacing right. The Donner-influenced Special Edition probably finishes second, as the right sequences are restored into the print, while the ones that slow down the storytelling have been kept out. However, for those fans who want to see as much extra footage back in the movie as possible, the Extended Cut is certainly the way to go. There's footage here for both the Krypton scenes and the Smallville scenes that hasn't been seen since that original ABC airing. 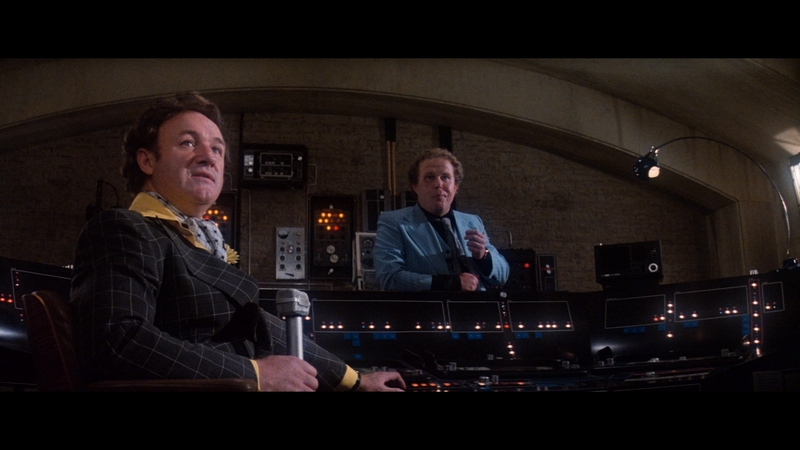 There's also a lot of Lex Luthor-related material put back into the movie, for good or for ill. Yes, at 188 minutes (compared to the Special Edition's 151 and the theatrical's 143 minutes), it's quite a marathon, but die-hard fans aren't going to want to be without this one in their collection. As for the more casual fan? Well, if you don't already own the Special Edition disc, that adds a lot to the appeal here. If you do already own that disc, however, be warned that the Extended Cut disc contains only the movie itself - there are no bonus features or a commentary track. For that reason, I can't give this two-disc release a rousing recommendation, but I think it's still worth owning, nevertheless. The Extended and Special Edition cuts of Superman: The Movie arrive on Blu-ray from Warner Bros. in a standard Elite keepcase. There are no front-loaded trailers on either disc, whose main menus are designed exactly the same, with a still image of Superman flying over Metropolis and menu selections horizontally across the bottom of the screen. The Blu-rays in this set are region-free. Both the Extended Cut and the Special Edition are presented in the 2.40:1 aspect ratio, although they are different in appearance. There's no denying it, the Special Edition looks a little better than this new Extended Cut. Of course, that release was totally remastered while this one appears to have made its way to Blu-ray with only a minor clean-up. I question whether the same source print (or negative if they went that route) was used for both transfers. Grain is still heavy in some scenes and on the obtrusive side at times. The color timing isn't the same here either, nor is the framing if you compare some of the shots of the Extended Cut with their counterparts on the Special Edition. Overall though, I doubt too many fans will be unhappy with the picture quality here. It certainly looks much better than it did on television back in February of 1982. Also keep in mind that this is the first time we've been able to see this version in all its widescreen glory as, of course, TV stations only broadcast in the 1.33:1 ratio back in the 80s. The Extended Cut comes with an English 2.0 DTS-HD Master Audio track, which is the only audio option for this disc. The Special Edition's feature track is English 5.1 DTS-HD Master Audio. While the Extended Cut's stereo sound doesn't have all the bells, whistles, and occasional feeling of immersiveness that the Special Edition track does, it certainly feels more natural and more in tone with what this 1978 film should sound like. No, it's not flashy, but it is clear and free from any popping, hissing, or muddiness. Another thing you'll get on the Extended Cut is different music cues from John Williams that are not in the theatrical or Special Edition version. In addition to the lossless 2.0 track, the Extended Cut features subtitle options in English SDH, Spanish, French, Japanese, Dutch, Korean, and Mandarin Chinese. The Special Edition has additional audio options in Dolby Digital 5.1 in Spanish (Castilian), French, German, and Italian, with subtitles available in English SDH, Spanish, German SDH, Italian SDH, Spanish (Castilian), Spanish (Latin), Portuguese, Dutch, Danish, Finnish, Norwegian, and Russian. Note: There are no extras on the Extended Cut disc. 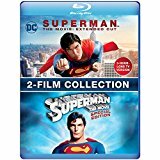 The bonus features listed below are all contained on the Director's Cut release and the disc is the same disc that was released in the Superman Motion Picture Anthology, and was the second disc in that eight-disc release. However, the bonus features contained are even older than that and all originate from the 2001 Special Edition DVD release of the film. Commentary - The Director of Superman: The Movie, Richard Donner and creative consultant Tom Mankiewicz talk about their work on the movie. Taking Flight: The Development of Superman (SD 30:14) - Part one of a three-part documentary about the movie, with this segment focusing on how Superman finally made it to the big screen in the late 1970s. This bonus feature is hosted by actor Marc McClure ("Jimmy Olsen") and includes comments from Christopher Reeve, Gene Hackman, Marlon Brando, Richard Donner, and Tom Mankiewicz, among others. Making Superman: Filming the Legend (SD 30:41) - This is the second part of the documentary, with this segment focusing on the shooting of the movie itself. It is once again hosted by Marc McClure and features many of the same members of the cast and crew providing comments. 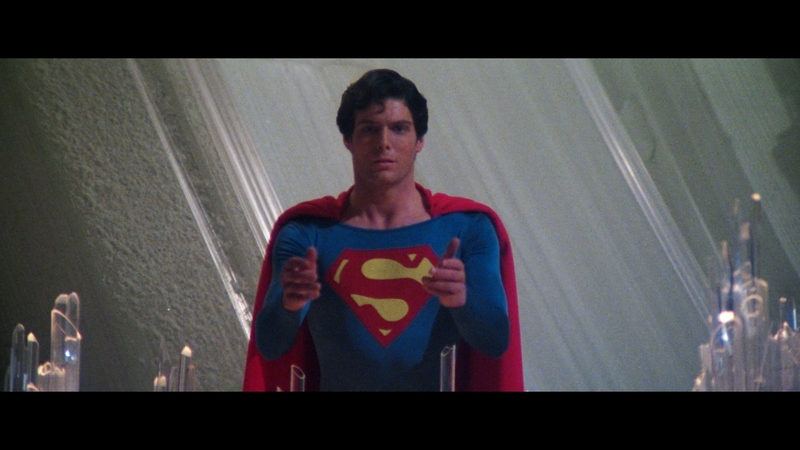 The Magic Behind the Cape (SD 23:45) - This final part of the three-part documentary (once again hosted by McClure, along with Optical Effects Supervisor Roy Field) takes a look at the special effects of Superman: The Movie. Screen Tests (SD 22:33) - A trio of screen tests for the characters of Superman (9:21), Lois Lane (10:57), and Ursa (2:06), which can be watched individually or back to back. Restored Scenes (SD 11:14) - A collection of 10 restored scenes, which didn't make the Special Edition cut on this disc, but do appear back in the film over on the Extended Cut disc. The scenes can be watched together or individually, and they consist of: "Jor-El and the Council" (3:21), "Security Council Meeting" (0:28), "Baby Kal-El's Starship" (0:08), "Young Lois with Parents on Train" (0:19), "Mrs. Kent Opens Up House" (0:37), "Clark and Jimmy" (0:26), "Jor-El and Superman" (2:23), "Pedestrian and Clark" (0:30), "Fire and Ice" (2:42), and "Hollywood Sign Falls" (0:16). Additional Scenes (SD 3:23) - A pair of additional scenes that didn't make the Special Edition cut, but can be seen over on the Extended Cut. These involve Luthor's pet "babies" that he keeps in his underground lair. Unlike the restored scenes, there is no option here to watch them individually. Additional Music Cues (35:44) - These are audio-only tracks of additional music for the movie, broken up into eight parts, which can be listened to together or individually. They consist of: "Main Titles" (6:08), "Alternate Main Titles" (3:49), "The Council's Decision" (7:55), "The Krypton Quake" (2:25), "More Mugger/Introducing Otis" (7:17), "Air Force One" (1:25), "Chasing Rockets" (3:39), and "Can You Read My Mind (Pop Version)" (3:04). Music-Only Track - The last of the bonus options is this music-only track, which allows one to watch the movie hearing only John Williams's brilliant score. Most Superman fans will probably already own the Special Edition disc in this set, so the real appeal here is the Extended Cut. While it does restore many of the scenes that didn't make the Special Edition cut back into the movie, they really don't add a lot to the film - giving fans basically another alternate cut of the title and, perhaps, a little nostalgia from the original TV broadcast. That said, for fans of this movie, this one is still Recommended.